By far the best approach to customising the look and feel of your process maps is to define at the outset the symbols and the symbol format that you need, and then produce an appropriately customised stencil. However, on occasion it will only become clear after many maps have been created that a change in look and feel is required. The Shape Type field is locked. To change the colour of the Node’s border or its text, click the coloured bars to load the standard Windows colour control. From this control, you can select a colour ‘by eye’ or by typing in the RGB value. 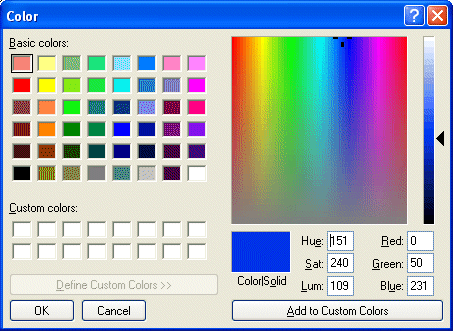 The basic colours are web-safe and will appear on a web page as they appear in Visio. Any other colours may not be represented accurately in a web browser. It is possible to swap the positions of the Node header and footer so that the title appears at the top of the Node. Shapes on a Visio drawing page inherit their formatting definitions from a master shape. Normally therefore it is only necessary to alter the master definition and all instances of the shape will be automatically updated. However, if a previous formatting change has been made to the shape, this breaks the link for that particular format and the format of the master and updating the master will not have the desired effect. The recommendation is to perform a batch update with this option turned off and only then turn it on if your shapes have not been updated as expected. When you are ready to proceed, click OK. Although there is a Cancel option to abort the process, there is no rollback. Therefore, if you press Cancel after the first five files have already been processed, then those five files will contain the new shape formats and the remaining files will not. We strongly recommend you take a copy of all files that are included in a batch update of format before you carry out this process by copying the directory structure of the Multi-Map as there is no undo function. You will then be able to roll back easily if this proves necessary.